Who are you, really? This is the central question. The question you might have been asking yourself all these years. Who are you without your title, your gender, your talent, your weight, your income, or your personality? If you strip away all of your niceties, all those embellishments that you've added to your persona to be accepted, what is left? If you wriggle out of all the identities that others have foisted on you, if you release all the ways you smooth out your rough edges so you can belong and feel safe, who are you? 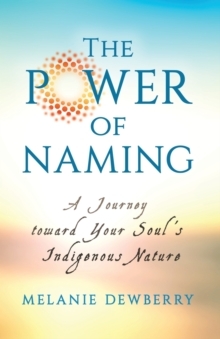 What is your core identity?The Power of Naming: A Journey toward Your Soul's Indigenous Nature is a beautiful guide to answering your soul's yearning to be known, to live on purpose, and to be authentic. To hear and elicit your name, you willneed to be honest with yourself and admit that deep down inside you have always had at least an inkling of your essence, but you've played a game of hide-and-seek with your soul. Through The Power of Naming, peaceful warriors are born, false identities and labels are cast off, and a deeper understanding of the true soul is unearthed. As you work through the chapters of this book, learning to apply the teachings imbued with the author's rich Native American and African American background, you will rediscover who you are and experience a new sense of freedom, love, and alignment with your highest self.